A complete plant profile is reflected in our full-spectrum oil, containing all cannabinoids and terpenes naturally found in hemp. plant lipids, while eliminating unwanted waxes and chlorophyll. requirements for making finished products. 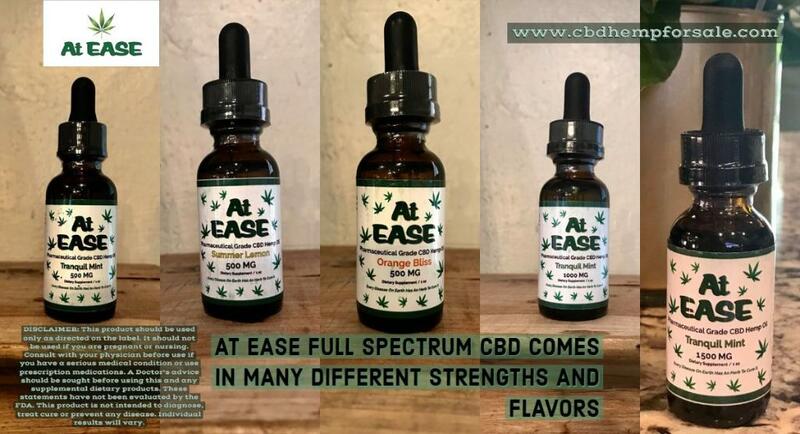 WHY CHOOSE AT EASE HEMP CBD OIL? — meaning you enjoy all of the benefits of CBD with no side effects and no high. This product is not intended to diagnose, treat, cure or prevent any disease and has not been evaluated by the FDA. psychoactive side effects of marijuana. Full-spectrum. Our products contain all of the cannabinoids present in our proprietary, nutrient rich strain of hemp known as PCR hemp. them pharmaceutical grade. They of the highest purity — with no binders, fillers, excipients, dyes, or unknown substances. same extraction process in the same facility — meaning you receive a product that’s reliable, predictable and effective. highest quality available, without any metals, pesticides or THC. that sets us apart from the competition.